North Dakota pulled off back-to-back Big Sky Conference championships in a gritty five-set battle against the #1 seeded Sacramento State. The #2 seeded Fighting Hawks battled from a 1-2 deficit to take down the Hornets. The Fighting Hawks led in almost every statistical category – kills (74-62), hitting percentage (.291-.198), assists (71-57), digs (104-84) and blocks (14-11). Overall, these stats are what kept them in the match with a red-hot Hornets team and brought them to the title and an NCAA Tournament berth. North Dakota will learn their NCAA Tournament fate following the NCAA Selection Show that is set for Sunday, November 26. How it happened: The first set saw the Fighting Hawks jump out to a quick 1-0 lead over the Hornets. The second set was a tight battle between the two teams that saw Sacramento State come out on top 26-24. That momentum from the second set carried into the third with the Hornets going up 2-1 in the match, needing just the fourth set to claim an NCAA berth. North Dakota fought back to take the fourth set by a large margin of 25-15. The final set saw the Fighting Hawks come out to an 8-5 lead and it was smooth sailing to the finish for North Dakota to take their second straight Big Sky title 15-10. Faith Dooley secured the MVP position in the tournament by posting 19 kills on a .500 hitting percentage along with 10 digs for a double-double and seven blocks. Ashley Brueggeman chipped in another 17 kills while Jordan Vail posted 14 kills on a .565 hitting clip and six blocks. Setter Sydney Griffin posted her second career triple-double with 12 kills on a .706 hitting clip, 56 assists and 11 digs along with five blocks. In the backcourt for the Fighting Hawks, Tamara Merseli picked up a match-best 27 digs while Alivia Fraase came close behind with 26 digs. Tamika Brekke and Teodora Tepavac each recorded another 12 digs. For Sacramento State, two players had double-doubles – Kennedy Kurtz recorded 49 assists and 18 digs while Mikaela Nocetti added another 17 kills and 12 digs. Lana Brown and Sarah Davis put down 12 and 11 kills, respectively. In the back row, Shannon Boyle, Brigitte Murdock and Skyler Takeda each picked up 17 digs. 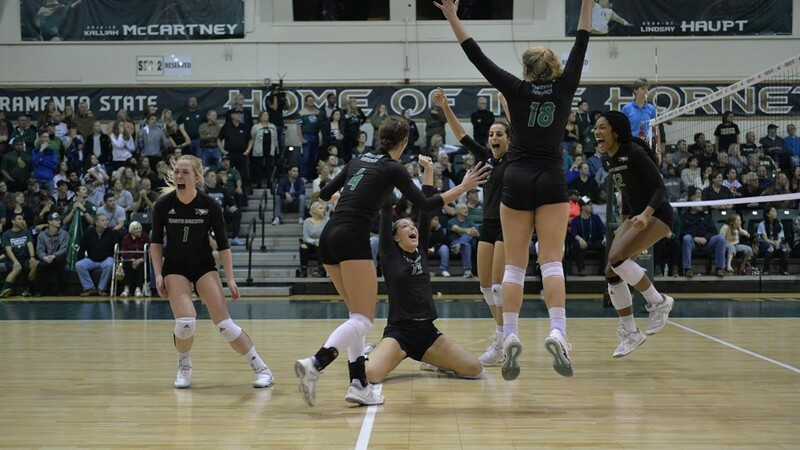 North Dakota repeated as Big Sky Conference Tournament champions after a thrilling five-set win over top-seed Sacramento State late Saturday evening. The Fighting Hawks rallied from down two sets to one, winning a convincing fourth set before controlling the decider en route to their second NCAA Division I Tournament berth in as many seasons. Senior Faith Dooley was named the tournament’s most valuable player for the second season, setting career highs with 19 kills and 10 digs in the win. She compiled 11 of those kills in the final two sets alone, including eight in that convincing 25-15 fourth set win. Sydney Griffin registered her second career triple-double with 56 assists, a career-best 12 kills and 11 digs. North Dakota (30-7) came out of the gate swinging, registering a rather tidy 25-19 win in the opener. The Fighting Hawks had a chance to take a commanding two sets to none lead, rallying from down 23-20 to pull it even at 24-all. But, the host Hornets were equal to the task, getting a Lana Brown kill then a UND attack error ended the set and sent the match to intermission all square at one set apiece. Out of the break, Sacramento State raced out with six of the first seven points to prompt a quick UND timeout. The Fighting Hawks would storm back to tie it at 8-8, but again, the Hornets were able to answer, this time with a 9-3 spurt to take the lead for good in that set and win it, 25-18 as Sac State grabbed the advantage in the match. The final two sets were a complete deviation from the first previous two sets as North Dakota steam-rolled through the final two frames, hitting .463 combined along the way. That fourth set saw UND hit an incredible .581 with 19 kills, seven from Dooley alone on the way to a convincing 25-15 victory. In the fifth, UND was in front at the switch, 8-5, and coasted from there, winning, 15-10. Dooley had four of UND’s nine kills in that stanza and the final point came on a Brueggeman swing that found the floor and sent the visitors piling on top of each other in celebration. “We really gave away set two with our own errors and set three was just abysmal,” UND head coach Mark Pryor atmitted. “We were just bad, and our court demeanor just wasn’t acceptable. Even before I could address that before set four, I hear Julia Kaczorowska talking very sternly to the team. I listen in, and she is talking about who we are and who we want to be, and she personally was not going to allow our season to end due to us losing our identity, and being selfish in a big moment. “That was it. She simply was not going to let any negativity get in our way. She stated it, it was addressed as a team, and they just rolled from there. We won because our team rediscovered their identity in a tough situation. They didn’t let the moment be too big. It was that type of leadership, and the fact that the team recognized that if we don’t self destruct, and follow the game plan, they couldn’t beat us. “We talked about how much this team loves each other and how much they are willing to fight for each other. That was on display in sets four and five and it was my proudest moment as a coach. North Dakota (30-7) will learn its first round opponent and location following the NCAA Selection Show, set for next Sunday (Nov. 26) evening. Notes: North Dakota is the first UND program to win back-to-back Big Sky titles … UND broke Sacramento State’s 11-match home winning streak … Ashley Brueggeman‘s 17 kills were a new career high … Teodora Tepavac had four kills for a new personal best … Griffin was the only player to record a triple-double this season in the Big Sky and she did it twice … Coming into the week, 28 Division I players had recorded triple-doubles and Griffin became just the 12th to do so more than once … UND added to its program record for wins (was 26) … North Dakota leaves the Big Sky (moving to The Summit League next year) with two regular season titles (2013, 2016) and two tourney titles (2016, 2017) in six seasons … UND was 7-4 in the Big Sky Conference Tournament, including 7-2 in the last four seasons … Mark Pryor improved to 103-39 (.725) in his four seasons at the helm at North Dakota … UND is 23-3 in November under Pryor … UND is now 7-2 all-time against Sacramento State … North Dakota hit .583 in the fourth set Saturday, its second-highest single-set hitting percentage of the season (.593 at New Mexico in second set, Sep. 2) and the fifth time it has hit .500 or above in a single set this year.